In March 2014, the Rift Valley Institute (RVI), through the Rift Valley Forum, together with the University of Gothenburg convened a regional conference on stabilization at the Kenya School of Government in Nairobi. The conference attracted some ninety participants from the Democratic Republic of the Congo (DRC), Somalia and South Sudan—people involved in civil society, government, the UN and the donor and diplomatic communities. Academics and specialists from Europe and North America also participated. The objective of the two-day conference was to question, review, evaluate and exchange lessons on stabilization programmes in the DRC, Somalia and South Sudan with the aim of informing policies that enhance peace and security in eastern and central Africa. This report presents highlights from this gathering and in no way aims to reproduce the debates and their conclusions in full. 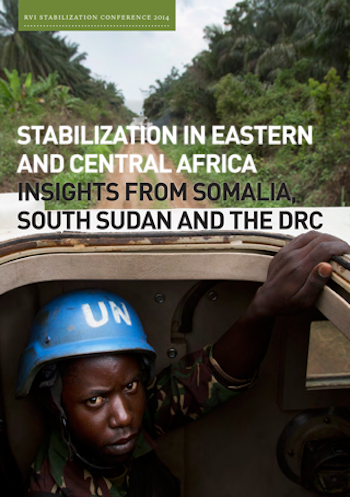 Giving space to voices from countries that are subject to stabilization programmes is central to this report. Their statements, explanations and clarifications are complemented here by those of regional and international specialists and experienced practitioners in international aid, development and stabilization.